Fortunately, as a freedom-loving state, Wyoming does not have many laws keeping law-abiding citizens from getting firearms and defending their God-given rights. This guide will go over everything you need to know how to buy a gun and be a responsible gun owner! Purchasing a handgun in Wyoming is a relatively simple process. There is no purchase permit required in order to buy a handgun, so you only need to worry about following the federal laws in order to buy your favorite pistol. If you buy your handgun from a private seller instead of your local gun store, you can actually skip the background check step completely! Of course, you won’t get that new-gun smell when you buy that Glock from the guy off Craigslist. Maybe other smells though. Another way to skip the background check, even if you decide to purchase from a licensed firearms dealer, is to present a Wyoming concealed firearms permit (CFP). It’ll save you a bit of time, and with all those guns you’ll be buying, it adds up real quick! It’s a long list, but as long as none of those situations apply to you, you’re ready to buy a gun! For those of you antique firearms collectors, there’s some bad news: there are no specific laws regarding antique and replica firearms in the state of Wyoming. This means they are treated just like any other gun, and you will have to go through the same steps and qualifications just like you would any other gun. Luckily there aren’t too many steps or requirements in the first place, so it’s not all bad! With the process for purchasing handguns being such a breeze, you might as well pick up a couple of long guns while you’re at it! Thankfully, the process of buying long guns is almost the same as it is for handguns, with no permits being required for long gun purchases either. Just like with handguns, you can avoid the background check step if you make the purchase through a private seller, or if you have a Wyoming CFP. And of course, any conditions that would prohibit you from buying and owning a handgun would also prevent you from buying or owning a long gun as well. Because Wyoming loves freedom and America, both open and concealed carry are allowed without a permit. There are a few basic conditions though. Easy enough, right? And don’t worry if you aren’t a resident of Wyoming. As long as visitors to the state have to carry permits or licenses from a state that is recognized by Wyoming, they can also carry in Wyoming. Even though Wyoming does not require a permit for open or concealed carry of firearms, many other states do require permits or licenses of some type. If you plan on carrying while out of state, Wyoming does issue concealed firearms permits. These permits can be presented to law enforcement officers when you are traveling in states that honor Wyoming permits (like Georgia or Alabama) and you will be allowed to continue carrying just like you would back home. 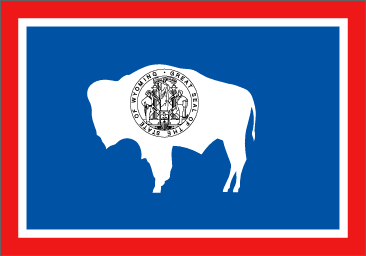 For those of you interested in getting a Wyoming CFP for your next trip out of state, or just anyone who wants to have a CCW permit that is recognized in over half the states in the country, check out our Wyoming CCW Laws section once you’re done here, so you can learn about all the steps you need to take to get a CFP, and the additional laws you’ll have to be aware of once you get the permit. Just because you can carry firearms without a permit, does not mean you can take your trusty sidearm (or long gun!) with you everywhere you go. Some places, even with a permit, are off limits to firearms. Any place with posted signs prohibiting firearms. Basically, if there are metal detectors at the entrance of a building, you probably won’t be allowed to bring your gun in with you. Signs outside stores and restaurants are also a good indicator. Your best bet in those situations would be to leave your gun in the car, preferably in a gun safe hidden out of sight. Speaking of guns in cars, you’ll need to be a little careful when transporting firearms. While it is perfectly legal to carry firearms openly or concealed when walking around, the rules are a little different in a vehicle. You can carry your guns while in the car, but only open carry. If you want to carry concealed in the car, you will need to have a CFP. This is important because if you decide to stick your Glock in your holster and have your shirt pulled over the gun while sitting in the car, you will need to have a CFP if you want to avoid any hassle from the police. 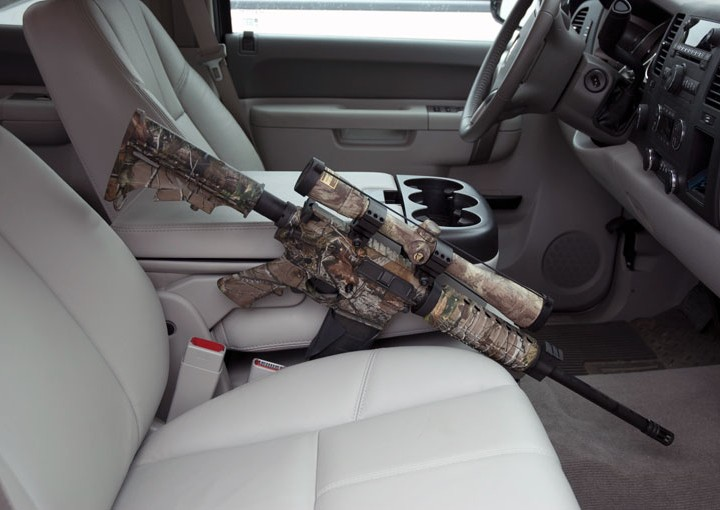 On the other hand, if you just want to keep your firearms sitting in plain sight while you’re driving around town, you’ll have no problem at all. Of course, keeping your firearms in locked containers in the trunk does not count as concealed carry, and is a perfectly fine way to keep them nice and safe while you’re in the car. Because it’s Wyoming, there are a couple hunting-specific laws all you hunters will want to pay attention to. Unless the state Fish and Game Commission has designated otherwise, you cannot use your firearms in any of those places. That does not mean you cannot carry your firearms, though they probably aren’t that useful if you aren’t allowed to use them. In addition to these places, it is also illegal to hunt, fish, or trap on private property without permission from the property owner or person in charge of the property. This includes firing your firearm from one person’s land onto another person’s land. You will actually need the permission of everyone whose land you are firing from and across if you don’t want to run into trouble with the law. And lastly, it is illegal to harass, pursue, hunt, shoot, or attempt to kill wildlife, except predatory animals, with any kind of flying machine, vehicle, motor-propelled wheeled vehicle, or vehicle designed for travel over snow. You gotta make it fair for the animals. No drones with guns! Aside from hunting and shooting at the range, you may also have to use your firearms in self-defense situations occasionally. Luckily, Wyoming believes in letting residents defend themselves with firearms, under the “Castle Doctrine” and “Stand your ground” laws. What is commonly referred to as the “Castle Doctrine”, is basically a law that allows for self-defense using deadly force while at home. Specifically, Wyoming law states you are allowed to use deadly force to defend yourself if you had a reasonable fear of imminent death or serious bodily injury to yourself or someone else while you are at home. You had reason to believe or know that the illegal and forcible act was occurring or had occurred. 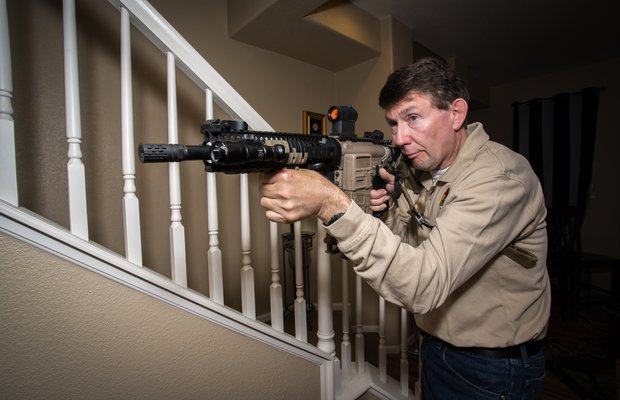 Essentially, if you hear a noise downstairs at night and bring your trusty sidearm and flashlight with you because you suspect a break-in, you are justified in using deadly force to defend yourself against whatever threats you encounter. Unfortunately, not all situations that call for self-defense happen in the home. Until recently, however, Wyoming law actually required you to run away if you encountered any situations where you might have wanted to defend yourself. As of March 2018, however, Wyoming decided it was better to let you stand your ground in self-defense rather than force you to flee. As long as you are somewhere you are legally allowed to be and are not breaking any laws, you are justified in using force to defend yourself. Of course, you cannot be the one who initiated the conflict. In other words, you cannot taunt or goad someone into threatening you with death or serious injury, and then turn around and claim it was self-defense when you shoot them. What you can do, however, is stand your ground and defend yourself and others if you’re out at dinner, and a guy comes running in with a gun pointed at the cashier. Hopefully, you never encounter a situation like that or have lots of other fellow diners ready to stop the threat too if you do. Even with these laws permitting self-defense, it is important to keep in mind that just because you are justified in using deadly force does not mean it is required. Taking a life is a serious decision, and you should always use your best judgment to decide what type of force is appropriate, or if it is necessary to stand your ground when retreating may be the safer option for you and others around you. That’s all you need to know about the gun laws of Wyoming! For those of you interested in carrying your firearms while traveling around the country, don’t forget to hop on over to our Wyoming CCW Laws section to find out all about the Wyoming CFP. Everyone else can get started on their gun collection! 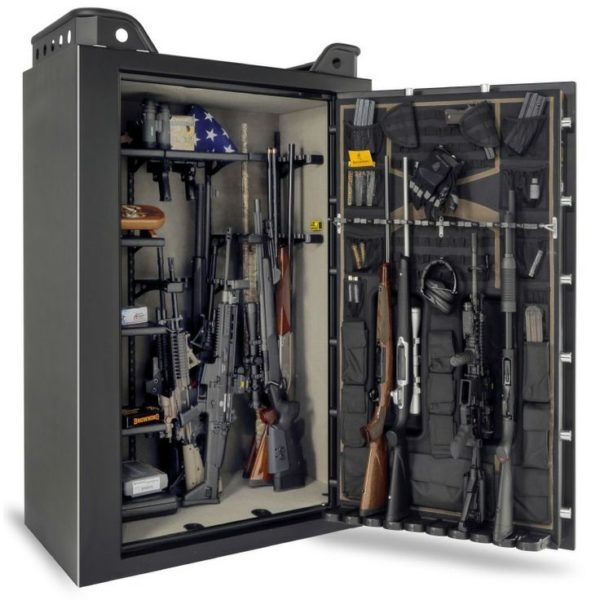 Wyoming does not have any specific laws on storing firearms, but for those of you with children, or just want to keep your gun collection locked away when you’re out of the house, a strong safe or inexpensive gun cabinet will do just fine.